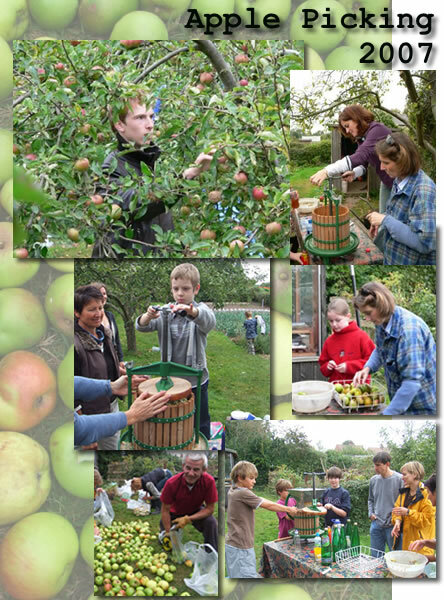 6th October, a fruit day, and the Shared Garden members came out in droves to pick the apples and turn some of it into delicious juice. A beautiful show of team work; we started by picking all the apples from the floor and sorted them into juicing and compost heap piles. Then the press, which we borrowed from The Arkwright Community gardens in the Meadows, arrived and the juicing process could begin. We had some apple washers, cutters, choppers, pressers and last but not least bottlers. There was a constant stream of a variety of cooking and eating apples being delivered by the pickers in the group. They selected the apples again and put the good apples aside to be shared later by the members. To keep spirits up everyone had a bottle of freshly pressed juice during the work, the rest was bottled and shared out later. Liz had baked some lovely apple cake and brought cinnamon coffee for all to taste and Monika and Andy treated us to apple tea and biscuits. The atmosphere was great, a wonderful way to get the community together. We even had some of the other allotment holders come and join the fun. We juiced about 15 litres and took home about 120 kg, not bad for a few hours work. Although the summer has been difficult in other ways, we were blessed with and outstanding apple crop.